Learning how to read MRIs, inspect cell tissues for tumors and shadow clinicians are lessons typically reserved for students in medical school, not high school. But a select group of suburban high school seniors are doing just that and more, thanks to a newly expanded youth residency program. McHenry West High School senior Julia Zickus watched a clinician administer an angiogram, a test that uses X-rays to photograph blood vessels. “And I saw them put a defibrillator in a patient,” she added. 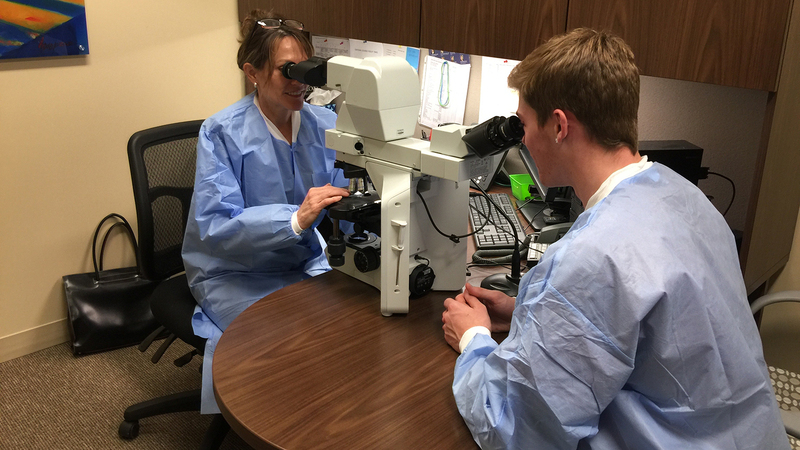 Keesey and Zickus, along with 25 other seniors at McHenry East and West high schools, are learning about various medical careers through a new partnership with Northwestern Medicine McHenry Hospital. During the yearlong program, students complete rotations with doctors, nurses, clinicians and other hospital staff. Long-term aspirations aside, he says, Northwestern chose to expand the program to McHenry this year because of staff enthusiasm for it. Before McHenry students begin their rotations in the hospital, they get a crash course in medical vocabulary. “It’s almost like a foreign language, so we like them to have a good background knowledge on that,” said Dziubinski. McHenry East seniors Hunter Russell and Sophia Veloz said learning medical terminology helped them during rotations. Russell said she was able to discern why patients came to the emergency department and how they were triaged based on classroom lessons. Students are also trained in CPR and learn so-called “soft skills,” such as interviewing, greeting people and introducing themselves, according to Dziubinski. Before each rotation, students are required to write a research paper about the career they will be shadowing. That assignment, Veloz says, helped reduce her anxiety about reporting to the hospital for the first time because it gave her an idea of what to expect. Nathan said students come well prepared for their weekly rounds in which they spend 2.5 hours shadowing staff, from nurses and doctors to laboratory technicians and environmental engineers. He says the program is invaluable in that it allows students to make informed decisions about career choices before college. McHenry West student Keesey agrees. “I think it’s really important to get kids out in the career field,” she said. “At such a young age we have to decide what we want to do for the future and usually what we do for the rest of our life.” And sometimes, past experiences influence those choices: Keesey had leukemia as an 11-year-old and wants to become a pediatric oncology nurse. For Zack Whitaker, who was part of the inaugural class of Huntley High School students in 2016, the program affirmed his desire to become an orthopedic surgeon by allowing him to “check off” other specialties from his list of career possibilities, which included obstetrics and gynecology. Now a sophomore at Baylor University, Whitaker is on the pre-medical track, with majors in finance and risk management insurance and a minor in engineering. He said the youth residency program gave him a leg up on other college students and prepared him for an internship at Kearny County Hospital in Kansas.